On October 14th 2000, After spending 10 hours the previous day, without even seeing one tuna, our luck was bound to change. Change it did! Just a few miles off the coast (above picture) and after only thirty minutes, Michael hooked a 344 pound Bluefin Tuna, just six pounds short of a giant. After nearly a two hour fight, Michael was exhausted and we had our 'tunny' as the English once called them (before they disappeared from English waters 50 years ago). 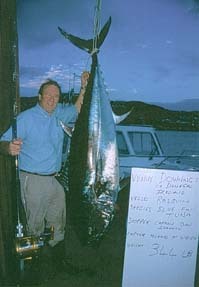 By the time we got to Downings Pier word had already spread of the big news: The first Bluefin tuna ever landed by hand and rod in this area, and we were just the second boat ever to catch one in Irish waters. Just 3 weeks earlier a charter out of Killybegs, Co. Donegal reeled in two giants. We wouldn't let that spoil this day. There was a huge crowd, and everyone was ready to celebrate. Hey it was Saturday, and this fishing village had just gotten its first taste of big game fishing! We celebrated that night at a local Pub and later, with a 'session' at scenic Fishermans Village. They say that this is the start of something big for Irish angling. We have proven that you can catch big game fish with alot of 'elbow grease' and the proper equipment. For a few years now, the big fishing boats have been catching bluefin in their nets off of the Donegal coast. There is not much sport in that. Hopefully the laws will be changed and someday the nets will all be gone, or else the tuna may just disappear and never come back. Nets are a sure way to over fish and ruin a good thing. In the past five years alone, Japanese factory ships have been caught in Irish waters, stealing hundreds of tons of bluefin. Here is a picture of Dan and I at Tranna Rossen beach, on Oct 15th 2000. A beautiful sandy beach, great for swimming, surfing and windsurfing. Its located on Atlantic drive, just to the East of were we stayed. My stay at Fishermans Village Lodge was perfect. Heathers' kitchen is brilliant, the smell of freshly prepared food fills the guest lodge day and night. The food was first class, we had 4 course home prepared meals every night, and frys ever morning. A "Fry" is a traditional Irish breakfast of Bacon, sausage, blood pudding, and fried egg. There is nothing like ending a home cooked Irish meal with a pint of Guinness and a Donegal turf fire with your feet up. I can honestly say that I have never eaten so well in any five days. I returned with more than great memories, at least an extra five pounds around the waist. The scenery just outside the door is incredible. The giant waves crashing on the rocks form the loud heartbeat of Fishermans Village, and the clean fresh air was a welcome break from the smog of Los Angeles. For such a quiet area, there is actually a nightlife. The pubs are open late in Downings, until 1 or 2 in the morning! We tested those 'last call' times on a few occasions during the week. There are five pubs within ten minutes of Fishermans Village. There is even a local taxi service , just to keep things safe. I hope some of these picures caught a fraction of this beauty. It was an honor to play a small part in this adventure, as photographer and now as story teller. For more info on the Rosguill or Baile an Lascaire follow the link. Sign my guest book, for the craic.